Summer is Here! So is Zika! ​We have all seen the news reports on and off since last year about the Zika outbreak in Brazil and its spread throughout the Caribbean and US Territories. Well, it is officially here in the lower 48 states and there are some things everybody needs to know and take seriously in order to avoid being infected by or spreading the disease. OSHA, USEPA and the Center for Disease Control (CDC) have web sites with lots of information and guidelines to help people protect themselves and their loved ones from the virus. Are there actually ZIKA cases here in the US? Yes. The CDC has a web site that identifies the reported cases by state. Bottom line is that there are few states without reported cases. But, remember, these are “reported” cases and does by no means indicate the actual number of cases out there. States with no reported cases may actually have people who are infected that have gone unreported. Is this a scare tactic? Yes. We are dealing with a new disease and with new data that is still being compiled and studied. We should take the warnings and precautions offered by the agencies seriously to avoid uncomfortable future conversations regarding Zika Virus infections and pregnancy. Can the Virus Spread from Person to Person? 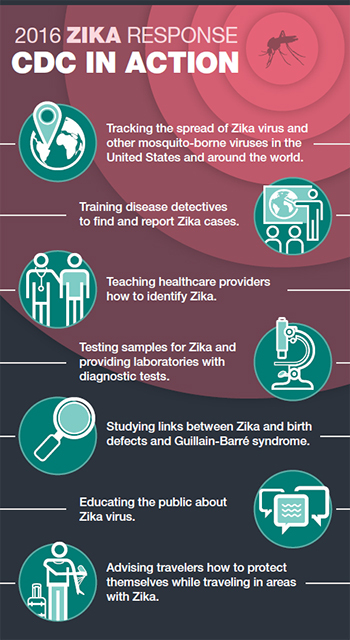 The Zika virus can also be spread from mother to child and through intimate personal contact between people. These are topics that I am going to let the health professionals talk to you about. In the meantime you can read the CDC guidance on people to people transmission and I recommend you contact your doctor with questions regarding your specific situation. Bottom line is that we should be conservative until the scientists are done researching this whole mode-of-transmission issue. Assume the virus is in your state and that all mosquitos can spread the virus and take appropriate precautions. How Do I Protect Myself, My Family and Our Employees? Bite Prevention - The good news is that Bite Prevention is made up of methods that are mostly familiar and easy to implement. These include mosquito repellents, wearing clothing over more of our bodies instead of less, and wearing that attractive netting over our heads (ok, it’s not attractive). Guidelines also include tips for how to best use repellents with clothing. The OSHA guidelines on worker protection can be found here. The CDC guidelines can be found here. Eliminate Standing Water - Eliminating places for mosquitos to breed is also important and is included in the guidelines. Make sure there are no areas of stagnant water where mosquitos can breed such as open trash cans, old tires, clogged gutters. And try to avoid wet mosquito rich areas in the first place. Bug Repellent - There is nothing like that pungent smell of bug repellent to remind us that summer is finally here. USEPA has a searchable web site that lists over 600 registered mosquito and tick repellents and includes their active ingredients and length of time effectiveness. The list includes repellents that contain DEET, Picaridin, IR3535, Citronella Oil and Oil of Lemon Eucalyptus to name a few. USEPA qualifies the information by saying that the data are based on technical information provided by each of the companies that manufacture or sell the products. The list can also be downloaded in PDF format and is found here.